The Amazon rainforest is a treasure trove of undiscovered plants. Among these are many fruits that are well-known to local people, but virtually unknown elsewhere. About 300 fruits are used by people living in the Amazon, compared with at most 30 in our supermarkets. One popular rainforest fruit is the ice cream bean (Inga edulis), so called because it is used to flavor locally-made ice cream. 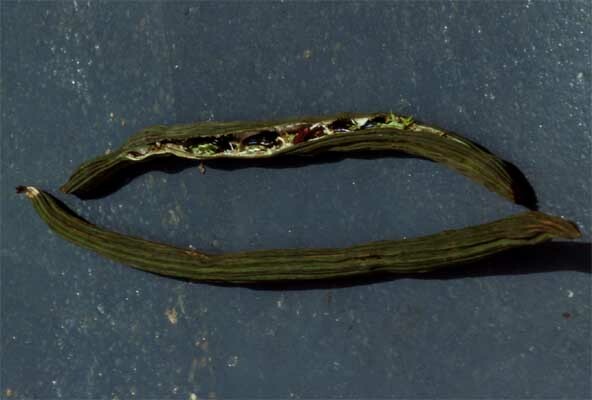 This picture shows an opened ice cream bean with the white flesh surrounding large black seeds. Fresh, it has a mild flavor. Although called a bean because it belongs to the bean family, the fruit grows long and dangling from a tree. The seeds commonly germinate while the fruit is still attached to the tree. If you look carefully, you can see the bright green of the first leaves put out by the seed while it is still inside the fruit! 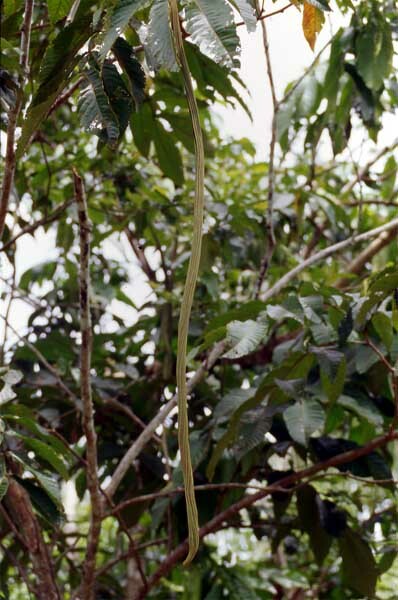 The ice cream bean grows on a sizable tree, which reaches perhaps 100 feet high. The tree belongs in the bean family (Fabaceae) which actually contains many thousands of speciesnot just beans!